Put out of your mind any preconception of what Ethiopia might look like and replace it with the very opposite. That’s is the kind of country we are dealing with here. A country of contrasts, of surprises, of shattered preconceptions. Forget drab dry scenery, unhappy faces, sand and interminable droughts and replace it instead with twisting road passes, lush high green mountains, sophistication and smiling faces. And coffee. Everywhere. Served by beautiful, genteel, bronze girls behind clothed tables, roasting fresh wild coffee beans with scented herbs in a ceremony of great social significance and gentility. Respect is shown for the process, the beans are presented for the approval of the imbibers and then ground and turned into a strong-enough elixir to make even the most hardened espresso-drinker’s hands shake a little. Amasekanalo – Ethiopian words are very long and very hard to pronounce. It means thank you. Ethiopia has much to be grateful for, despite its complicated colonial past and its more recent political turmoil. You would think, for example, given the instability of some of the neighbours – such as Kenya and Sudan – that the fact that Ethiopia is essentially a Christian country with a forty percent Muslim population might present a few challenges, but not at all. We were told by Muslims that to insult a Christian in Ethiopia, in any way, was a mortal sin. And by Christians, that to insult a Muslim was a mortal sin in the same vein. Problem solved. Ethiopians are, above all, a tolerant, calm, smiling, polite people with a well-earned pride and deeply-entrenched integrity. The country’s history is a delightfully mangled version of the actual events, interspersed with legend and drama of, often literally, Biblical proportions. They tell you without even the smallest modicum of doubt that they have the Ark of the Covenant (although we know, of course, that Indiana Jones has it) and that the Queen of Sheba (who was beautiful and not half-ape, as some disrespectful non-Ethiopians have suggested) visited Solomon’s Court and consequently bore him a son who was the first Emperor, leading to a long line of Christian Emperors which ended with Haile Selassie (who doubled up as a Rastafarian God in his spare time) and many of whom, at the heads of their massive armies, fought off invasion by hordes of all descriptions, but mostly Italian. And you believe them, because not to do so would be disrespectful and would risk cutting short the story. It would be like interrupting a Venda guide who was telling you that the Xhosa prophetess Nongqawuse had met King Arthur and sired a line of saints in Albania. Why wouldn’t you listen? And just buy into it a little to see what happened? We had three different guides tell us the same story, in great detail – and eventually we almost believed it. The evidence is there, even if it is a bit bonkers. Our journey began with an over-full Ethiopian Airlines flight arriving, heavily laden with small Ethiopians and their overflowing bags and boxes of blankets, car parts and food processors, arriving two and a half hours late in Addis Ababa. At night, on the day before New Year’s Day. In September. Yes. They have their own calendar, as well as their own language and alphabet. The Ethiopians actually don’t do anything in quite the same way that everybody else does. We had our first coffee ceremony before we had even found our transport. We had pre-booked only the first night and a driver awaited us, whistling us through the hybrid ancient and modern streets of Addis to our hotel. The tiny over-furnished room was full of the kind of surprises that Ethiopia throws at the traveller all the time. Too much clobber and not much of it working. Huge dysfunctional lights, sloping shelves, loose-tapped basins and rocking beds. It was as if there had been an earthquake but nobody had straightened up afterwards. We slept though, and looked forward to breakfast. And coffee. It is ill-advised and nigh-on impossible to hire a car so we had arranged a driver, who had little English, as promised. It had been clearly pointed out that Semagn was a driver, not a guide, so we armed ourselves with a Lonely Planet and pointed where we wanted to go. “Chigarillo!” came the response. Every time. It meant ‘No problem’. And when he said it, he meant it. Semagn was the nicest guy in the world, with a ready grin and considerable driving agility, bobbing in and out of donkeys, tuk-tuks, horses and carts, goats, pedestrians and low-flying cars and trucks. The traffic police stopped us once or twice but, contrary to the South African system, waved us on the moment they realised we were tourists. We had been recommended to stop at the Stelae at Tiya, our first introduction to ancient Ethiopia. These dramatic tombstones pierce the sky with engraved pictorial stories of the life buried beneath, interpreted for us with skill and charm by a local guide from the village and followed, inevitably, by a coffee ceremony in a grass-strewn tarpaulin shelter. Moving on, and after dropping down into the Rift Valley, we stopped just short of the home of Rastafarianism for our first taste of the local food. Don’t expect to like injera. While the stews and pastes daubed on top of it can be delicious, injera itself is little more than a sour dough pancake. It looks like a cement-flavoured facecloth and tastes only a little better than one. You will get used to it, but I venture to suggest that you will never really like it. There is, however, little alternative in most places. Shashemane has little to show for its fame as the home of Bob Marley’s religion. Red, yellow and green dominate but you are warned not to be dragged into anything illegal. The town is, however, thought-provoking if only in wondering why it is that so many foreigners want to be Ethiopian and yet so many Ethiopians want to be foreign. Ethiopians talk about the rest of Africa as if they are somehow not part of it. Our destination, Bale Mountain Lodge, in the national park of the same name, was a wonderful revelation of green-topped peaks and cloudy forests. We particularly enjoyed the hikes and the birding, managing 47 species on our first one-hour walk, including the Abyssinian Black-headed Oriole, White-cheeked Turacos, numerous Augur Buzzards (including melanistic) and the extraordinary Abyssinian Catbird, and all of that despite the rain. Climbing Gujaralle, the peak in front of the lodge we saw numerous black and white colobus and even a brief glimpse of the rare Bale monkey but it was breath-taking in more than one sense. I mentioned to our guide, Awel, as he skipped effortlessly through the bamboo and swung on the vines that lined the steep slopes, that I was feeling a little jaded, and was relieved when his reply came that we were almost 4000 metres above sea level. Ethiopia is high and much of the Bale Mountains National Park is more than 3800 metre above sea-level. 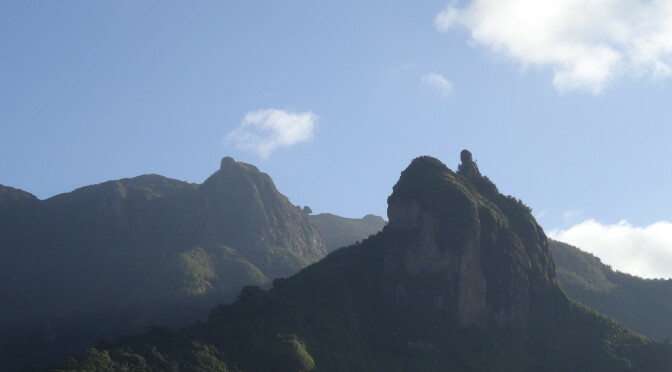 The highest point on the park’s Afro-Alpine Sanetti plateau, Tulu Dimtu, peaks at 4377m. eWe loved the lodge, we loved the food and we saw a lion; one of very few in the park. Awel had never seen one before and didn’t believe us when we told him what it was. On the way out, though, he showed huge skill in locating the wolves for us. The icing on a magnificent high-altitude cake. 6-metre high lobelias and coffee included. Another night in Addis Ababa and a short flight to Mekele saw us shifting from wildlife to history. Our guide on this occasion was Kidane, an archaeologist and fluent French- and English-speaker, whose knowledge of the rock-hewn Tigrayan churches of the Gheralta cluster was second to none. He and Sisay, the driver, whisked us up and down the mountains around Adigrat and Hawzen, in and out of churches, including the Maryam and Daniel Korkor, and through the most beautiful scenery imaginable for four days, ending in Aksum with its awe-inspiring stelae, the church that (arguably) houses the Ark of the Covenant and the Queen of Sheba’s palace. Kidane was a consummate host and we were sorry to part from him and his enthusiastic stories but Lalibela called with its extraordinary churches carved, not out of the rock, but out of the ground. An afternoon in the so-called New Jerusalem could only be the high point, and it was. But where was everybody? Ethiopia’s history and its architecture are as mind-boggling as Egypt’s and yet we barely saw another visitor, which was wonderful, of course, for us but not good for Ethiopia. It is the perfect destination for South Africans. Easy to get to. Inexpensive accommodation. Stunning scenery. Friendly people. Go there. It is only the year 2008 in the local calendar and you will genuinely feel eight years younger the moment you step off the plane. And as you tuck into plate after plate of cement-flavoured pancakes, remember that the questionable food fades into insignificance in the face of the sheer magnificence of Ethiopia. And the delicious coffee. Contact Molla Miheretu of FKLM Ethiopia Tours on info@fklm-tours.com for a driver to take you to the Bale Mountains. He can also help with the planning of your entire trip. www.fklm-tours.com. Alternatively email Red Jackal tours on info@redjackal.net. Kidane and Hailu (our guide at Lalibela) may be booked through them. www.redjackal.net. Bale Mountain Lodge can be contacted on bookings.bml@yahoo.com. Seewww.balemountainlodge.com. Visitors travelling internationally on Ethiopian Airlines are entitled to considerable discounts on domestic flights, which operate like buses and – like buses – are often full and late. South Africans do not require visas in advance when flying into Ethiopia but must buy a visa, currently US$50, at Addis Ababa’s Bole International airport. There are no compulsory vaccinations. Chris Harvie received no discounts and paid in full for all travel and accommodation.